Did you mean: dreams of bali (20 items)? SALVADOR DALI signed/#'d "Moses and Monotheisme" framed "Dream of Moses"
Salvador Dali 'the Divine Comedy' Hand Signed Woodcut "The Siren of the Dream"
Dali Dreams of Gala by Eddy Barrows (English) Paperback Book Free Shipping! 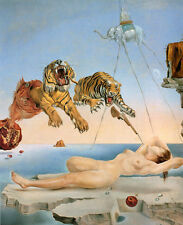 Salvador Dali "Dream of Venus II" Lithograph Limited 2000 pcs. SALVADOR DALI Poster or Canvas Print "Dream Caused by the Flight of a Bee"